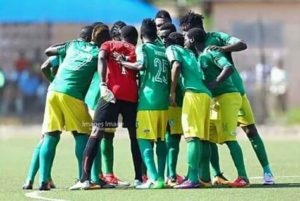 Ghana Premier League Champions, Aduana Stars are set to work with 17 players in the upcoming Special Competition which commences in February. Report close to the Dormaa based outfit reveals that only 17-players will get to feature for the two times Ghana Premier League winners. Both in the Betway sponsored two days tournament and Special Football League. The team has however officially announced the resumption of training session on Wednesday in Dormaa after the Christmas holidays.The team will be having a double training session everyday as part of preparations ahead of the resumption of football. Footballghana.com can reliably report that, management of Aduana Stars have registered only 17 players. Aduana Stars will participate in the four team tournament organised by Betway company involving Liberty Professional, Ashanti Gold and Medeama SC. It's a two day tournament set to be held in Obuasi Len Clay Stadium, slated 19-20 January. Information gathered suggest, the 'Fire Boys' management team are not ready to renew players whose contract are due to expire and willing to terminate contract of other players.